Billericay is a town in Essex with a population of around 30,000 people. It was first recorded as Byllyrica in 1291, but the exact origin of the name is unknown. It has a historical link to the Peasant's Revolt due to The Battle of Billericay in which the King's soldiers defeated and killed 500 Essexmen. The town was said to have been the meeting place of the Pilgrim Fathers shortly before their voyage to the new world in 1620 and many of the names around the town reflect this historic occasion. In 1655 another group of colonists named the town of Billerica, Massachusetts after their English hometown. The two towns are now twinned. As interesting as all that (and more) is, the focal point of my visit to Billericay was Lake Meadows Park which was opened in 1936. The park covers 40 acres of land and has over 30 species of trees. Its features include formal gardens, tennis courts, swimming pool, children's playground, various sports pitches, skate park, and a bowling green. There is also a man-made lake and this was commissioned by the Spitty family who once owned the land, then called Hill House Farm. The family were apparently fans of shooting, and the lake was dug to attract wildfowl so that they could host 'elegant shooting parties'. The lake is currently home to a six foot long cat-fish called 'The Beast of Billericay'. 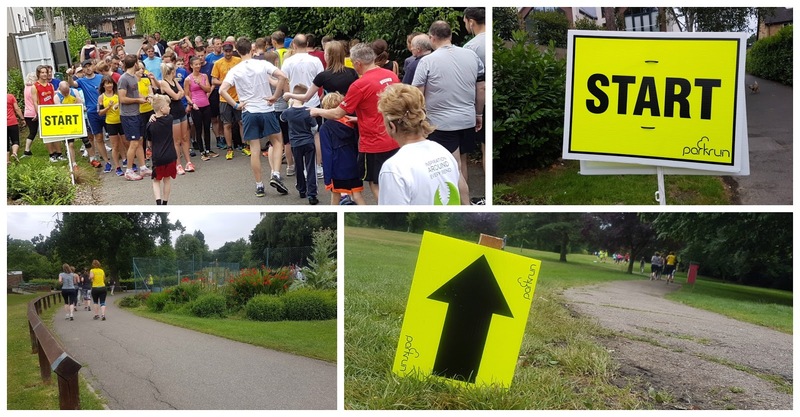 On 24 June 2017 the park became home to Billericay parkrun. We headed over to the venue for their second event and once arriving, parked in the Lake Meadows car park. The official course page directs attendees to park in the Radford Crescent car park which is just outside the park. Both are free-of-charge on Saturdays but charges do apply Monday to Friday. A few hundred metres to the south of the park is Billericay train station and bus interchange station - it's only a five minute walk to the entrance of the park from here. I didn't spot any proper bicycle racks but there were plenty of fences that one could use to secure a bike. The toilets are adjacent to the car park, and just next to 'The Wizard and The Dragon' sculpture. The sculpture itself has in interesting story - in 2013 an old oak tree had died and was due to be removed for safety reasons, however the 'Friends of Lake Meadows Park' suggested and arranged for it to be recycled into a sculpture - you can read all about it here and see some before and after photos here. The main meeting point for the run is on the large open grassed area near the Cafe in the Park, and the run itself takes place over four gently undulating, anti-clockwise laps of the park. Underfoot is roughly a 50/50 mix of tarmac paths and grass/dirt. I visited in the summer when the grass was fairly dry and road shoes were fine, but there is a possibility that it could get a little muddy in the winter. I suspect a pair of multi-terrain shoes would work well here during the winter months. At time of writing, the official course map does not show the start and finish points correctly (this is quite common). The actual start line for the run is tucked away on the entrance spur at the southernmost point of the course where the park can be accessed from Lake Avenue. With the first timers briefing and the main run briefing both already having been held over on the main grass area, as soon as all the day's participants were in place we were quickly sent on our way. The lap itself is fairly straight forward, and it goes a little like this... You head off from the spur on the tarmac path, which is at the highest point of the course. It's not very noticeable but the elevation drops a little as the route passes the tennis courts. The course then bears right onto grass. The course heads ever-so-gently uphill through this part of the course and the most easterly point of the course brings you back to a high point. After swooping down the grassy, and only really noticeable downhill section of the course (I saw one person slip here, so be careful), the runners rejoin the tarmac path for about 50 metres before crossing onto the grass that follows the northern perimeter of the park. This section has a slight hint of trail about it and comes with a warning sign to watch out for tree roots and low hanging branches (seriously, watch out for the branch!). The route then rejoins the path and the participants head around the curved path that circumnavigates the western bank of the lake - watch out for the drop to the left onto the bank of the lake. Sadly, and despite looking, I didn't spot the beast. Whilst heading around the curve, flanked by the blue, iron fences eagle-eyed runners may spot the conservation area to the right, which helps sustain the park's wide variety of wildlife. The playground is passed next and the path leads directly into another slight incline - not terribly noticeable, but it does start to feel a little harder as the laps progress. Heading past the finish area and the Cafe in the Park, the incline becomes slightly more noticeable and once the runners pass the sensory garden (it smelled amazing) they emerge back where it all started just a short while earlier. 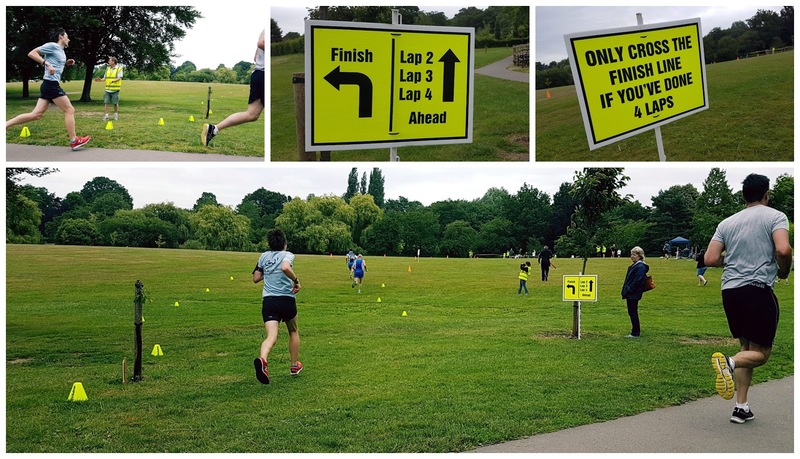 The full 5k is covered by completing just under four full laps, so upon reaching the cafe for the fourth time, the runners can swing a left onto the grass and follow the cones for about 100 metres until reaching the finish funnel. During my visit, barcode scanning took place right next to the finish line and it was then time to head off to the 'Cafe in the Park' (which was a little expensive and cash only, so come prepared) for some post-run refreshments and a chat about the morning's very enjoyable run around Billericay's beautifully landscaped and picturesque town park. With a relatively high number of laps comes the inevitable flurry of lapping, but if everyone pays attention there's no reason that this should be a problem. I've done a bit of maths and everyone running over 25-26 minutes is likely to be lapped. To give you an idea of what to expect, I ran 20.55 and I estimate that I lapped everyone slower than about 28 minutes meaning that I lapped around 100 people out of the 171 that took part. Whichever pace you run at you will either be lapped or lap someone else. Back to the park itself, and since 2001, the park has been home to a bronze statue, named 'Child in the Park' and I was planning to take a look. However the statue was not there during my visit as it had recently been stolen. Fortunately, it was found (in a wheelbarrow) and will be reinstated once repairs have been made to both the statue and its plinth. Another couple of notable points are that the park hosts the largest fireworks display in the whole of Essex, and it also hosts up to 5,000 people for other outdoor events such as music concerts. I imagine any events of this size could lead to the parkrun being cancelled so be sure to double check the Billericay parkrun webpage before travelling to ensure you don't have a wasted journey. So with all the chatting and the selfies-with-the-wizard-and-the-dragon and the playing-in-the-playground done and dusted, it was time to carry on with the rest of our day. As we were about to leave, I had a notification that the results for event 2 had been published. So I had a quick gander at them before hitting the road. I had also recorded the GPS data from the run and you can view it on Strava if you would like to see the course in more detail. As the 18th venue to start in the county, Billericay is another fine addition to the set of parkruns in Essex and well worth a visit. It's deceptively undulating, but still a pretty quick course. When I showed my brother the relive course video, he spotted that the shape of the course resembles Totoro with his hand out while he's waiting at the bus stop in the rain, and after watching the video, I have to agree!